Rev. James O. Evans, a member of the Louisiana Annual Conference, was honored as “Louisiana Advocate of the Year” at CASA’s state convention held this month in Baton Rouge. 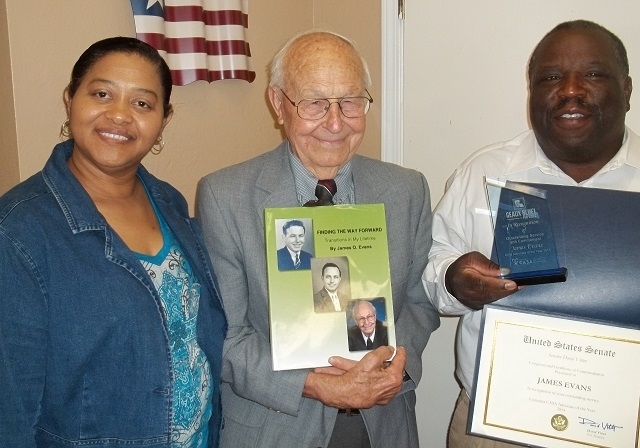 The 89-year-old retired United Methodist pastor represents children to the local courts with such effectiveness that he earned this recognition after serving for only two years as a volunteer Court Appointed Special Advocate. He was chosen from among hundreds of other volunteers, many of whom have served for over 10 years. Evans has researched the needs of children who are in foster homes after being removed from the care of their parents due to neglect or abuse. Rev. Evans got involved in CASA when he moved to DeRidder two and a half years ago. He had been involved in youth ministry for the entire span of his 35 years of pastoral service in the Louisiana Annual Conference. After his retirement, he was instrumental in establishing Epiphany Prison Ministry for youth incarcerated at Swanson Youth Centers in Tallulah and Monroe. James’ first book of memoirs, Called to Serve, chronicles his own childhood spent living in Lincoln Parish in extreme poverty during the Depression era. Ever the advocate, Evans as served with Sister Helen Prejean as a spiritual advisor on Angola’s death row. Determined to change the fact that Louisiana has the highest rate of incarceration in the world, he has devoted his retirement years to serving as a spiritual director for prison ministry. He also has been a vocal proponent of opportunity for people of all races and backgrounds to use their talents through his leadership with the Board of Church and Society. In 2004, he was awarded the Sarah Schoeffler Award by the Board of Church and Society. Even though he has been retired for 26 years, this octogenarian insists that no one should “ever quit making a difference for those who are hurting” as outlined in Matthew 25: 31-46. In addition to his service in CASA, James organizes volunteers to ring the Salvation Army bell each December, and supplies pulpits once or twice a month at local United Methodist and Presbyterian churches. Rev. James O.Evans is shown, center, at the recent CASA convention. Pictured with him are Advocate Supervisor Rochelle McMahon, left, and right, Tommy Edwards, Executive Director for CASA of Vernon and Beauregard Parishes. Evans is holding his recently published second book of memoirs Finding the Way Forward. Edwards is holding the CASA award and a U.S. Senate resolution, commending Rev. Evans for his service.